Nature is predicted to play a large role in interior design for 2016. With the focus being more on the planet these days, many commercial and individual spaces are using natural elements and colours to emphasise the importance of this cause. This can be seen with several of the collections that are currently displayed at Design Miami 2015. 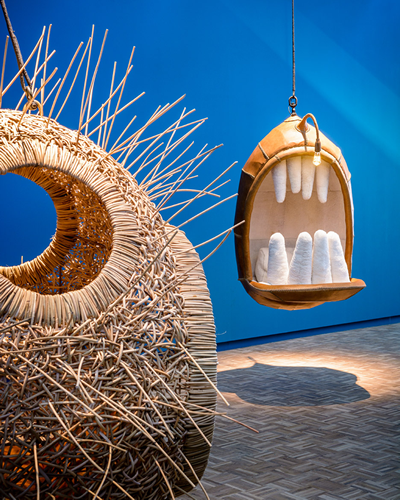 Porky Hefer’s “Monstrera Deliciosa” is the one that has caught my eye the most, in particular the “Fiona Blackfish” killer whale hanging seat. Fiona Blackfish has been created with the use of white, grey and black leather that has been stitched together and completed with a tail, a fin and flippers. The seat is created with pink fur, creating a tongue and leather is used to create the teeth. The way that the seat is created to hang, allows for the illusion of the fish “swimming freely” as they would in the natural World. Keeping to the nautical theme, the rope that is used to suspend the seat has been “spliced”. This is a knotting technique that is often used on yachts for extra strength. This will also ensure the durability to make sure that the rope doesn’t snap. 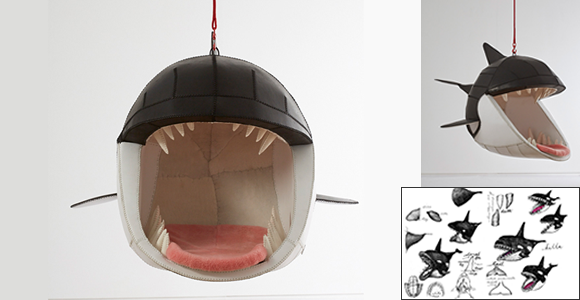 You wouldn’t want to be dropped while sat in a killer whale’s mouth! 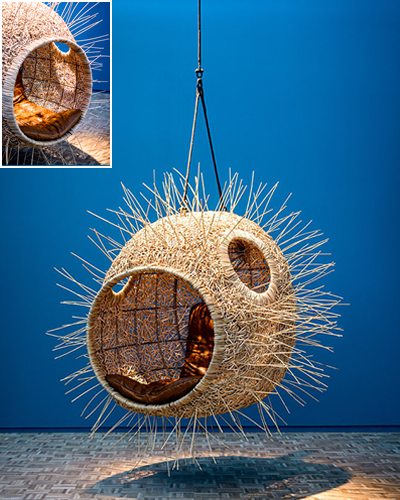 Another fantastic piece that Hefer has displayed is a “puffer fish” that has been created by weaving kooboo cane into a round nest-like structure. Three openings are left to create the eyes and it’s mouth. The mouth being where the entrance to the seat is and the ends of the cane are left as “spikes” to create the puffer fish façade. 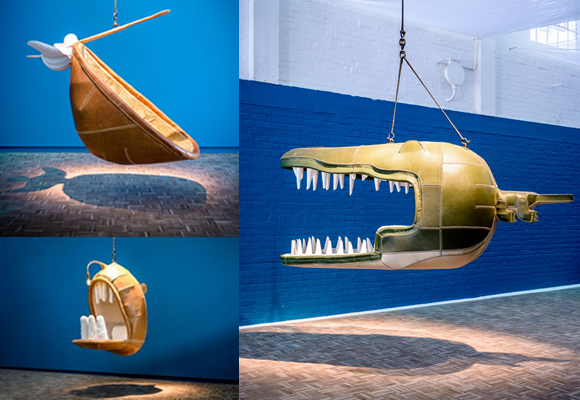 Other “Monsters” which are exhibited at the display are Hefer’s “Crocodile and Pelican hanging seats”, in addition to his “Sea Monster”. 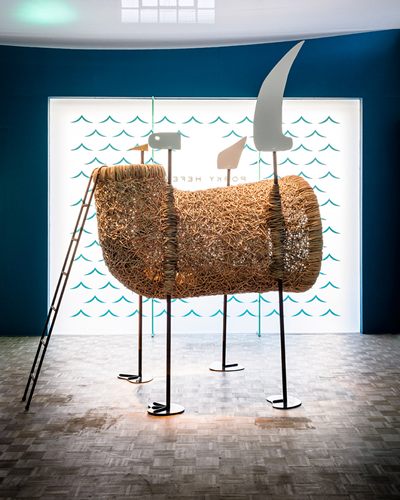 The rest of the collection is on display in the Southern Guild’s Cape Town Gallery in his home town. “My pieces get people to think about nature, and it’s fragility, and make them consider how to protect it”. The way in which the animals are developed allows them to look friendlier and the comfortability softens the reputation that these creatures and that often comes with predators. Having a seat inside a predator allows for you to feel at one with nature. The nesting environment in which these seats are designed makes you feel safe and calm. From a viewer’s point of view, humans sitting in the mouths of these predators could be seen as a reversal of roles. The human being top of the food chain, becomes insignificant sat in an oversized mouth, representing an animal that is often hunted. A “friendly” effect is emphasised by the fluffy seats, the nesting and for the “Anglerfish”, the light that lures you into a comfortable seat. These effects may show that Hefer was trying to show us that the animals that are often associated with danger are judged unfairly, should be treated with more respect. Powerful stuff! The talented artist receives help from talented craftsmen, including weaver Ismael Bay. Ismael has trained weavers at the “Cape Town Society for the Blind”, where a lot of the designs are produced. “In this way I use his traditional knowledge and weaving skills and subvert these into non-traditional forms, making them more relevant”.